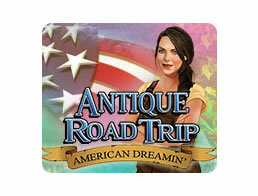 Antique Road Trip: American Dreamin' Game - Download and Play Free Version! Great news! You've become the proud owner of a little shop in Beechwood Cove, one of the most premier centers for antique goods in the country. The bad news is that's all in the past. Not only is the town little more than run-down burg at this point, but your shop doesn't even have any antiques to sell. Thankfully James and Grace are here to help. They'll show you how to get your store up and running, as well as point out where the best rummaging pits in the country can be found. By keeping your eyes sharp and your business senses well-tuned, you'll turn Beechwood Cove into a booming town of antiquities all over again! You have no antiques to sell, and you have no money to buy them. You're going to have to get some stock the old-fashioned way: by finding it. Travel all over the country and pick up every little bric-a-brac you can find. Find items in 15 different locations in the continental United States, from Nevada's Red Mine to a doll store in Rapid City, South Dakota. A new list of items is generated every time you start up a new HOG. Play as many HOGs as you like. There's no end to them. Prepare for a challenge. HOGs grow increasingly more difficult the more times you play them. Collect money as you clean up your list. The money you earn from finding items depreciates over time, so scoop up the objects quickly. Find resources and building materials that will come in useful at a later date. Resources include lumber, bricks, paint and envelopes. 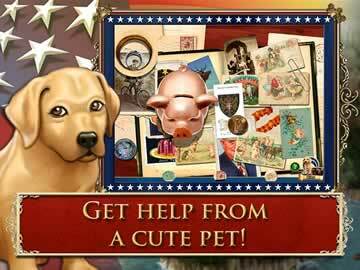 Enlist the help of your dog if you're having trouble finding some things. Just don't push him; dogs need to rest too. You might eventually get some merchandise to sell, but anyone with shopkeeping experience will tell you that's only half the game. Presentation is the other. 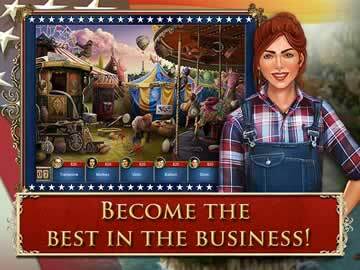 Antique Road Trip: American Dreamin' gives you a lot of opportunities to personalize both your game and your shop. Give your profile a unique name and avatar. Clean up and repair both the interior and exterior of your shop to make it more presentable to customers. Fill your store with all the necessary furnishings to get it up and running. Purchase better cars that will regenerate Energy faster. Collect a variety of pets over the course of your career. Give them unique names and buy accessories that will make them look even more adorable. Your store isn't the only place that needs to be fixed. All of Beechwood Cove is in desperate need of help. If you can do the neighborly thing and help the people restore the place, you'll be rewarded with all sorts of useful perks. Fix up the other buildings and add your own personal touches to them using your accumulated wealth. Buy food from the Snack Shack and eat it to restore your Energy. Purchase building materials from Jillian's Hardware Store. Head on over to the Porcelain Restorer to repair broken items via a series of challenging puzzle mini-games. Play a different brand of HOG over at the library. Sort through pictures and photographs to find where the listed images come from. Acquire more pets by building an animal shelter in town. There are more ways to make a profit in Antique Road Trip: American Dreamin' besides looking around for valuables. There are many challenges to undertake and favors to complete for your friends and neighbors. Doing both will get you some extra coin and then some! Accept missions from James, Grace and the rest of neighborhood. Look extra hard for specific items that people ask for when you go off to play a HOG. Earn money and experience for a job well done. Make collections out of specific antiques and turn them in to get even more useful goodies. Collections can include animal-themed cookie jars, love letters, flower bouquets, elf figurines and more. Earn prizes by unlocking dozens of achievements. Antique Road Trip: American Dreamin' is a charming little game that combines village building with scavenger-hunting to provide an unforgettable experience. With an escalating series of challenging HOGs and mini-games, beautiful visuals, and a charming bluegrass soundtrack, this game will put you right into a proper antiquing mood. Take a free trip with the Antique Road Trip today!